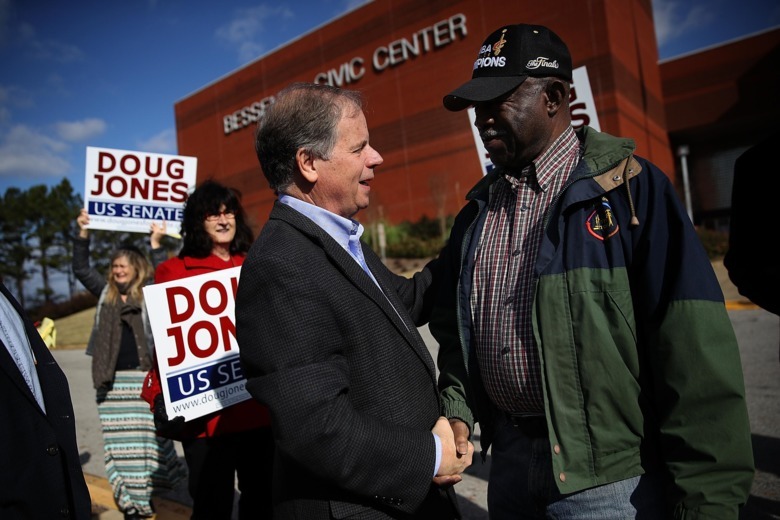 Democrat Doug Jones greets voters outside of a polling station at the Bessemer Civic Center on Tuesday in Bessemer, Alabama. One of the big questions going into Tuesday’s special election in Alabama was whether the state’s black voters would turn out in large enough numbers for Democratic candidate Doug Jones. On Saturday, HuffPost’s Jennifer Bendery wrote that Jones would need black voters to comprise, at the very least, 25 percent of the electorate to be competitive–or, more realistically, turn out at rates close to Obama’s 2008 run, when black voters comprised about 28 percent of the electorate. There was broad skepticism that this was possible. “I hate to say it but he’s no Barack Obama,” state representative and Legislative Black Caucus chair John Knight told CNN bluntly last week. A Washington Post piece from November reported that black leaders were concerned many in the community were unaware the special election was even happening. A Jones mailer that hamfistedly argued a black candidate with the allegations leveled Moore wouldn’t be viable was loudly criticized and taken as emblematic of the Jones’ campaign’s inability to connect with black voters. The Root’s Michael Harriot wrote that the mailer itself might have cost Jones the election. “The flyer is reductive in its oversimplification of the black mind as only caring about black issues,” he wrote. “While it might not be racist, it is certainly racist adjacent.” Others focused their attention on the efforts of Alabama Republicans to disenfranchise black voters, including a restrictive voter ID law passed in 2011 and currently being challenged NAACP’s Legal Defense Fund. 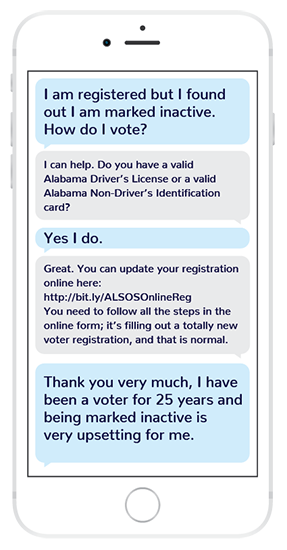 A group called Open Progress is funding a large text message campaign with African-Americans. A nonpartisan group called the Voter Participation Center is reaching over 300,000 black voters here with direct mail and text messages. And NextGen America, a national group funded by Tom Steyer, the billionaire environmental activist, lent an organizer to an Alabama-centric group, Woke Vote, to help mobilize historically black college campuses. The Alabama special election will be remembered as a highly unusual race that saw the defeat of an almost surreally bad candidate. Nevertheless, one of the lessons that might hold true for Democrats moving forward is that mobilizing black voters in conservative states en masse may be more possible than many imagined–even for candidates not named Barack Obama.